I'm not sure about the proper use of terminology: the Wikipedia article on percentile includes the text: "The term percentile and the related term percentile rank ...". Also, the talk page on percentile has comments from people insisting that "percentile" and "percentile rank" have different meanings; but in reading both the articles percentile and percentile rank and both their talk pages, I can't see the distinction actually explained. I know that percentile scoring is not commonly understood -- it is often confused with percentage --, so that I have to be careful where I use the terminology. While I more often try to estimate percentiles for psychological characteristics, I am going to use mass for my examples because it is easier to precisely define and specify a measurement procedure for. I know what I mean to get across when I make a statement of the form, "I estimate that I in the about Xth percentile for Y (for population Z)", and I believe that for people who understand the difference between percentage and percentile my meaning is getting across. What I am questioning is whether, like some statements that we have all made in math classes, my usual expression is strictly speaking not correct or strictly well-formed, and that there is a more precise compact way to express my meaning. And what is this supposed difference in meaning between "percentile" and "percentile rank"? There are a couple of minor nitpicks that could be made with that statement both regarding equality. The first and simplest problem is that while it is possible to imagine referencing myself to a population that I am not a part of (eg, EU citizens), I haven't actually done so in practice; since I am a part of the population to which I am referencing myself, there must by logic be at least one individual whose characteristic of interest is neither less than nor greater than mine, me. This effect would be of numerical significance if I were comparing myself to college class of, say, 25 students -- after all, there is no way that less than 4% of the students of a 25-student class that I am in could have a test score equal to mine --; but for the cases in which I have actually made a statement of my percentile level, the population has been large enough that this effect is lost below the level of precision given in my estimate. The other is that in such large populations there are extremely likely to be other individuals with the same measured value as mine. In the mass example, even if masses were measured to the nearest gram (which is a ridiculous level of precision for this application), there would still quite likely be someone else with a measured mass equal to mine. (Also, note that mass varies by a lot more than that even if one could somehow could exclude from measurement things like the contents of the gastrointestinal tract and bladder, etc. I'd actually guess that I lose more than a gram to respiration (I take in oxygen but exhale carbon dioxide, also water vapor is lost in breath.) in the half-mile walk to town, never mind that to perspiration. The scales at my doctor's office include tenths of a pound, and I question the utility of even tenths of a kilogram for anyone able to stand to the scale -- some of the extremely premature babies that I have read of, yes, integer pounds might be too coarse, but they are not going to be weighed on a floor scale that is meant to be stood on.) When stating a percentile for an individual; how to count the equal values in a population is a question that likely must be resolved for precise statistical work, but for the type of guesstimates that I am usually doing when I make statements about my estimates of my percentile in a particular characteristic, this effect is completely lost in the noise of the imprecision of my estimate. It looks like the percentile rank is the percentage of values that are below a score (so, just a number), while the percentile is the group of all of the values that are below a given percentile rank. 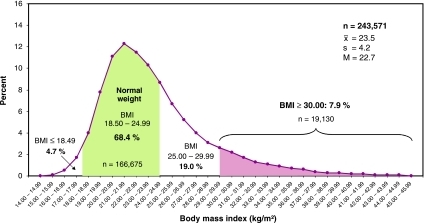 If your mass is at the 89th percentile (89% of the population has less mass than you), then the percentile rank for your weight is 89, and everybody with less mass than you is in the 89th percentile. So, the nth percentile always contains the lower n% of the population, whereas only the score(s) at the cutoff point have a percentile rank of n.
Sizik wrote: It looks like the percentile rank is the percentage of values that are below a score (so, just a number), while the percentile is the group of all of the values that are below a given percentile rank. If your mass is at the 89th percentile (89% of the population has less mass than you), then the percentile rank for your weight is 89, and everybody with less mass than you is in the 89th percentile. So, the nth percentile always contains the lower n% of the population, whereas only the score(s) at the cutoff point have a percentile rank of n.
I've always understood e.g. 89th percentile to include only the 89th-ranked 1/100 of the group, so in a group of 1000 values, the lowest 10 are in the 1st percentile, the next 10 (11-20) are in the 2nd percentile, etc. Rather than the nth percentile containing the lowest n% of the population, each percentile contains 1% and they are non-overlapping. Likewise, quintiles divide a population into 5 groups of 20% each. From my understanding of the wikipedia articles, they're basically inverses of each other. So, for example, in some population the 89th percentile of mass is 100kg, and the percentile rank of 100kg is 89. The percentile is a mass, and the percentile rank is a percentage. To me, a percentile is a group of 1% of the population, too. Likewise, deciles, quintiles, quartiles, thirds and halves are sets of non-overlapping groups that sum to the population. To nitpick the OP requires a quick definition: are we counting percentiles from 0th to 99th or from 1st to 100th, i.e. defining them by their lower or upper boundaries? Assuming the latter, if you're in the 89th percentile 89-point-some percent of the population are below you and 10-point-some percent are above you, so it'd be better to simplify to 89% and 10% with an implicit "at least" on each, not 89% and 11%. This also reduces the trouble caused by large groups with equal scores, at least out to the sides of a widely-spread bell-curve with several significant figures in the measurements. Around the mode, it may be better to use broader terms like deciles and "40% are below and 50% are above" or whatever, especially if you're reporting mass to the nearest 5kg. Anyone in the 8th, 9th or 10th decile on there probably needs to go for a long walk. measure wrote: I've always understood e.g. 89th percentile to include only the 89th-ranked 1/100 of the group, so in a group of 1000 values, the lowest 10 are in the 1st percentile, the next 10 (11-20) are in the 2nd percentile, etc. Rather than the nth percentile containing the lowest n% of the population, each percentile contains 1% and they are non-overlapping. Likewise, quintiles divide a population into 5 groups of 20% each. For example, if a score is at the 86th percentile, where 86 is the percentile rank, it is equal to the value below which 86% of the observations may be found (carefully contrast with in the 86th percentile, which means the score is at or below the value of which 86% of the observations may be found - every score is in the 100th percentile). First, apologies for taking so long to respond to this thread I started. Before I respond to comments directly, I'll make some comments about precision. I used mass in my example for several reasons: one of which is that as a physical quantity it has a precise definition; though in practice as a clinical observation there are limitations not based on limits in the current limits of physical measurement. Ie, I'm guessing that given an inert (ie, not having internal movement like a heartbeat or respiration) mass of about my size (c. 100 kg) that changes of 10^-8 could be detected in two measurements about a month apart; however, I could "gain" about 300 g in a few minutes by eating two hot dogs with buns and drinking about 100 mL of water. And even if I were in a hospital and my intake and output of solids and liquids could be precisely measured, my own feeling is that variations in the rate of insensible perspiration even under similar conditions would limit the clinical significance to, at best, .1 kg (a level of 10^-3). I spoke of using an online calculator that gives percentiles as well as BMI: for BMI purposes, I personally don't consider anything below the 1 kg as having any real significance. In my case, based on the weighings at the doctor's office, I'd say that my mass has been stable for over a decade at 100 +/- 3 kg. It has wobbled back and forth within that range, but with no apparent trend. These are the problems with precision in mass measurements for clinical purposes. Now consider that the Myers–Briggs Type Indicator (MBTI) includes an attempt to measure something called introversion/extroversion. First, there is fact that this quality of introversion/extroversion is not as precisely definable as the basic physical quantity of mass; essentially the question of what exactly is it that one is attempting to measure isn't as clearly precisely defined. Second, the question of how well it is that a procedure measures what it is that one is attempting to measure is also a discussed problem with psychological tests even when one is satisfied with the definition of what is it there is a attempt to measure. Third, in psychological testing there is always the question of test-retest reliability; eg, how similar are the results if it is given to the same individual on successive days. Fourth, if I haven't even actually taken the test (and so could at least have my percentile rank in the actual scoring precisely defined (though with a clinical precision limited by test-retest reliability)) but am only attempting to estimate where I would fall, there's another hit to any claims of precision. Sableagle wrote: To nitpick the OP requires a quick definition: are we counting percentiles from 0th to 99th or from 1st to 100th, i.e. defining them by their lower or upper boundaries? I'll note that in the usual case where I am "reduced" to estimating a percentile rank worrying about this level of precision in definitions would be unjustified anyway; though, I do understand that for actual formal work that some precise definition must be chosen. I'd always understood things the way that measure stated until I looked at the Wikipedia article. Oddly, though, I don't remember seeing any thing as clear as the unattributed quote at the end of Sizik's message here in any of the Wikipedia articles or talk pages when I read them before posting or after the distinction was explained on this thread; though, after reading the explanation here, I did re-read the articles and talk pages, and it is clear that this is the distinction the Wikipedia authors and commenters did have in mind; though, I still don't see how someone unaware that this distinction is made could figure out what the authors and commenters are referring to from the actual articles and talk pages. Last edited by fagricipni on Thu Aug 16, 2018 3:28 pm UTC, edited 1 time in total. I mean, maybe the Wikipedia article has changed since you first read it, but my post was based entirely on the descriptions there because it's been too long since my last math class for me to depend on any starting knowledge or understanding of the difference between the terms. It's clear to me now from reading the talk pages on the two articles that the commenters have Sizik's distinction in mind, but that's what I couldn't resolve from the articles and talk pages on Wikipedia.